MEET JOYCE MITCHELL: Joyce Mitchell, Broker/Owner of Locations Montana, has specialized in resort and recreational properties since beginning her career with Eagle Bend Golf Community. In 2004, she was name the MONTANA STATE REALTOR OF THE YEAR, a tremendous honor for her and reflective of her dedication to her profession and her clients. Joyce will guide you through the purchase process and will make sure that your questions are answered in a timely manner. The Purchase and Sell Agreement is a nine page document used by Realtors and approved by the Montana Association of Realtors. It will be accompanied by supporting required documents such as Mold Disclosures, Agency Disclosures, Condominium Disclosures, etc. Home Inspections are always considered a prudent part of the buyer’s due diligence and are encouraged. One Year Builder Home Warranty accompanies any purchase made of a Bear Dance condominium. Design Change Orders forms are used should you purchase a unit that is not yet completed and wish to upgrade or change from what is intended in the construction of your residence. Lender and Title Companies though the selection of a lender is made by the buyer, we have several excellent lenders in the Bigfork area who are very familiar with the Bear Dance and can expedite the process for you. We have selected a title company in Bigfork located just a few blocks from the Bear Dance to handle all escrow matters, providing title and the settlement statement and recording of your purchase. Financing. We have partnered with a progressive local bank with an office in Bigfork to assist you, should you choose to finance your purchase. Both the title company and bank partners are familiar with the Bear Dance and will work diligently to assist you in making your purchase a seamless transaction. 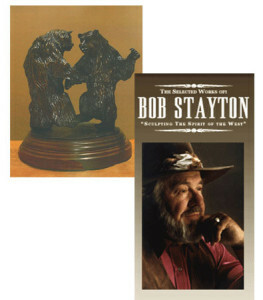 Prior to his death in 2010, John and Marilyn Olson had commissioned well-known Montana Bronze artist and cowboy storyteller Bob Stayton to create the dancing bears as a focal point that graces the courtyard. And, as a special closing gift for each original owner of a Bear Dance residence, a limited tabletop replica is presented.